bowlingball.com continues its commitment to excellence by bringing you an economical way to replace that Perforated White Microfiber (S6) Replacement slide sole. 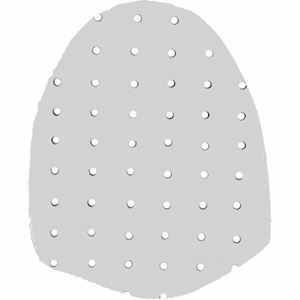 This Perforated White Microfiber (S6) slide sole is a perfect replacement sole for any interchangeable sole bowling shoe. The unique over sized sole allows you to trim it to fit any size shoe. Just take your old sole and trace an outline over the replacement piece and cut. You are ready to bowl.